I always get the chili, side salad and French fries. Can't go wrong with the basics. It's also a good family type restaurant to go to. Plenty of parking in the rear. Drinks are always good and the staff always friendly. Went for lunch several times. They do not take reservations but you can have helpings of buttered popcorn while you wait. It is a fairly large place so the wait is never long. The food is very good and plentiful. All the seafood dishes are delicious. Deserts are scrumptious. Service is great! Highly recommend Crickets. 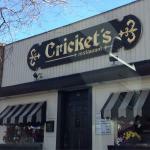 Being a frequent visitor to Sayville I had walked past Crickets on numerous occasions and was curious. Joining a friend for lunch presented an ideal opportunity. The restaurant has been there a long time, and it shows. Dark and dingy. Food was mediocre as was the service. Overpriced for a less than satisfying meal. Avoid. Treated my sister for her birthday last Monday. We both ordered our regular Stuffed Shrimp with mashed potatoes and Cole slaw. We love their popovers, an excellent substitute for the typical breads offered at other restaurants. This day, however, I didn’t feel well after eating one of the shrimps and I couldn’t eat the remaining two. My sister didn’t have the same reaction though. So maybe I just wasn’t feeling well. I brought home the 2 shrimps & my husband ate them with no ill effects. I will return but I won’t be ordering Stuffed Shrimp anymore because I associate them with how I felt. Been to Cricket's? Share your experiences!